Vince Vaughn as a bald-headed, tattooed prison inmate? I didn’t see that one coming, but that’s what we get from 2017’s Brawl in Cell Block 99. Bradley Thomas (Vaughn) loses his job so he agrees to move drugs for his pal Gil (Marc Blucas) to better support his wife Lauren (Jennifer Carpenter). Eventually related crimes send Bradley to prison. Bradley owes a debt to a cartel, and they kidnap Lauren. To save her, Bradley must kill a fellow inmate, a task that places him amidst a mix of challenges. Based on the film’s title and its promotional art, one might expect Brawl to deliver a 1970s-influenced “drive-in” action flick. Much of the movie feels like a throwback to that era. Brawl doesn’t become a campy semi-spoof, though, as it plays its material seriously. It avoids the urge to go for the kind of period parody that usually befalls projects of this sort. I admire that, as it allows Brawl to nod toward its obvious influences without a strong trace of goofiness. The movie gives us the general feel of the 1970s but it turns into a darker, more serious tale than expected. These facets come as pleasant surprises, but do they make Brawl an actual good movie? Meh – as much as I appreciate some of its elements, it doesn’t turn into a consistently satisfying affair. One substantial problem stems from its running time. Going into Brawl, I assumed it’d clock in around 95 minutes, whereas it actually fills a mind-numbing 132 minutes. That’s “serious drama” territory, not what you’d expect from a prison-based action flick. We tend to feel that length, especially during the movie’s nearly interminable first act. 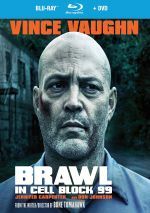 Brawl takes a very, very slow path to get where it wants to go, as Bradley doesn’t actually enter prison until around 46 minutes into the story. That’s about half of the full running time I expected from Brawl. It’s a good 20 minutes more than the movie needs to develop its narrative and characters, and Bradley doesn’t finally reach Cell Block 99 until nearly 90 minutes into the film. If the movie used the cinematic real estate better, I wouldn’t mind, but it dawdles and drags. On the surface, I should appreciate the fact that Brawl proceeds at its own deliberate pace, but too much of the material seems monotonous and slow for slow’s sake, not because the tale needs to progress in that manner. With a different title and focus, the sluggishness might matter less, but face it: fans go into a flick like this with a certain expectation for lively action. They don’t get it, as Brawl opts for small-scale battles and a slow boil. Even if I ignore those preconceived notions, Brawl stalls because it really does run too long. The film simply fails to move along the narrative at an appropriate rate, so many of those minutes feel extraneous. Ultimately, this turns Brawl into a mixed bag, as it’s a film I respect more than I enjoy. I appreciate the serious and subdued nature of the project, and I like the fact it subverts genre clichés. However, Brawl remains a tough slog because it moves so damned slowly. This doesn’t result in a particularly impactful payoff, so Brawl becomes an erratic experience. 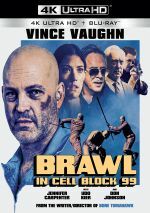 Brawl in Cell Block 99 appears in an aspect ratio of approximately 1.85:1 on this 4K UHD Disc. The movie came with a quality transfer. The film offered positive delineation. I thought the image brought us consistently nice clarity and accuracy, with only a smidgen of softness on display. The image suffered from no signs of jagged edges or shimmering, and it also lacked edge haloes. Print flaws remained absent. In terms of palette, Brawl went with a heavy blue tint, though some green overtones appeared in the prison scenes. That restricted variety and vivacity, but the hues seemed fine given their constraints. Blacks came across as dark and deep, while shadows seemed smooth and concise. The image worked well. 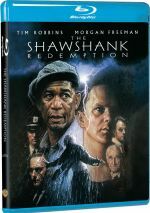 As for the movie’s DTS-HD MA 5.1 soundtrack, it largely followed the subdued nature of the film itself, though it popped to life on occasion. A few action-oriented sequences opened up the spectrum and gave us some involving elements. Nonetheless, these remained fairly infrequent. Instead, the film generally opted for ambience and stereo presence for the music, factors that made this a restrained soundscape. Audio quality worked fine, with natural, concise speech. Music sounded full and clear, while effects came across as accurate and tight. Nothing here impressed, but the mix satisfied. How did the 4K UHD compare to the Blu-ray version? Audio remained identical, as both discs offered the same DTS-HD MA 5.1 soundtrack. Visuals showed mild improvements, mainly due to a step up in definition, as the 4K provided superior accuracy. It also came with deeper blacks. Colors seemed very similar, though, as the 4K lacked HDR. That surprised me and meant the hues and contrast didn’t stand out as expected. Still, the 4K UHD looked quite good, even if I didn’t think it fully utilized the format’s possibilities. Two extras show up here, and we start with a featurette called Journey to the Brawl. It fills 15 minutes, 10 seconds with comments from writer/director S. Craig Zahler, producers Dallas Sonnier and Jack Heller, and actors Vince Vaughn, Jennifer Carpenter and Don Johnson. “Journey” looks at the project’s development, story/characters, cast and performances, Zahler’s impact on the shoot, sets and locations. The featurette offers a decent array of notes but it lacks much depth. During a Beyond Fest Q&A, we get a 31-minute, 31-second panel with Vaughn, Carpenter, Zahler, Johnson, Heller, and actor Udo Kier. The Q&A examines cast and performances, story and characters, and various aspects of the production. Like “Journey”, the Q&A delivers a smattering of good notes but it doesn’t dig as deeply as I’d like. This set also includes a Blu-ray copy of Brawl. It provides the same extras as the 4K UHD. A spin on the prison drama genre, Brawl in Cell Block 99 delivers an erratic affair. While I appreciate aspects of the production, it moves at such a glacial pace that it becomes an endurance test. The 4K UHD provides largely good picture and audio along with a few decent supplements. As much as I respect some of the film’s choices, the end result leaves me a bit cold.